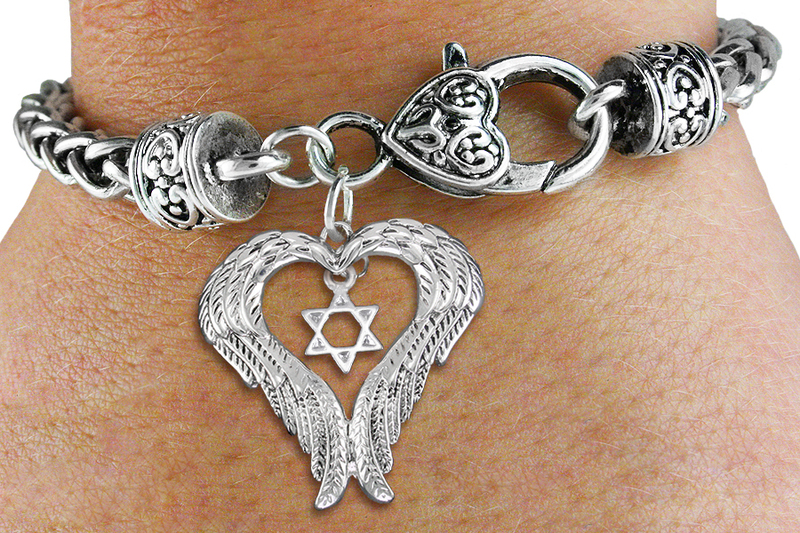 "God Blesses Those That Wear The Cherubim's Wings of Love"
Exclusively Ours! Lead & Nickel Free Antiqued Silver Tone Guardian Angel Wing Pendant With Free Hanging Detailed Star Of David Charm Comes On An Intricately Detailed Antiqued Silver Tone Chain Bracelet, With A Heart Shaped Lobster Clasp. Great Idea For Religious Friends And Family. Guardian Angel Pendant Measures: 1 3/4"h x 1 5/8"w Religious Charm Measures: 5/8"h x 1/4"w.
Suggested Retail Price - $27.50!